Paihia is the main tourist town in the beautiful Bay of Islands region. 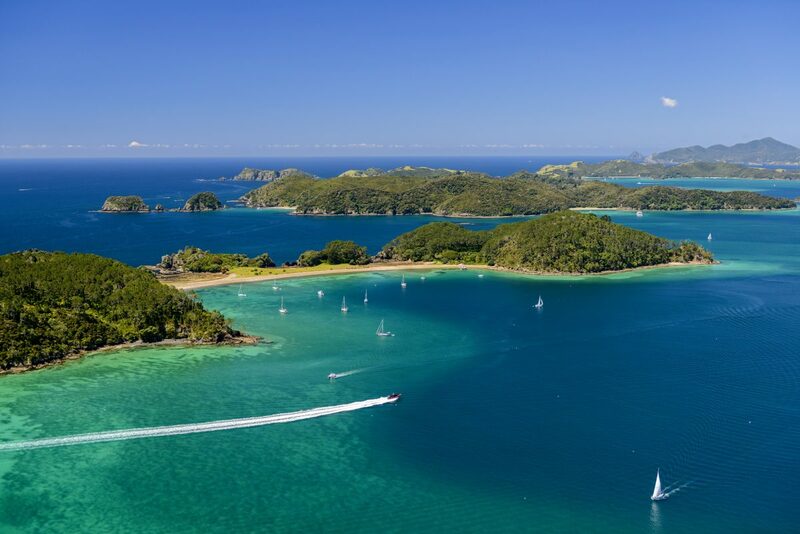 With 144 islands and bays, the Bay of Islands is one of the best maritime parks in New Zealand. It’s just a few hours north of Auckland, so make sure you schedule some time in this subtropical paradise while you’re in NZ! Thanks to its enchanting islands, sandy beaches, abundant marine life and breathtaking views, you’ll want to spend most of your time in the Bay of Islands by the sea. There’s a great range of tours and cruises in the Bay of Islands to help you explore. The Fullers GreatSights name has been synonymous with the Bay of Islands for over 125 years. It has a well-deserved reputation as the leading operator of dolphin watching cruises and day tours around the Bay of Islands and Northland. Fullers GreatSights is officially licensed by the Department of Conservation to interact with dolphins and whales. Even better, a portion of every ticket sold goes towards dolphin research in the Bay of Islands. You can choose from a range of full-day and half-day cruises to make the most of your time in the Bay of Islands. A Hole in the Rock dolphin watching cruise is the best way to experience the thrill of seeing dolphins in the wild. Set off from Paihia for a half-day cruise, travelling around the islands and out along the Cape Brett Peninsula to the famous Hole in the Rock. As a bonus, if you’re travelling on a FlexiPass, the Hole in the Rock cruise is included in your pass with no extra to pay – just the hours required for the cruise! Warm waters make the Bay of Islands the best place to view and swim with wild dolphins. See these delightful, curious creatures race alongside the boat and show off their aerobatic skill! Bottlenose and common dolphins are frequent visitors in the Bay of Islands and these spectacular performers love human company. Other marine wildlife like seals, orcas, whales and penguins are also frequent visitors. If conditions permit, you can even grab a snorkel and flippers and jump in to swim with the dolphins. We’ve got some tips and tricks on how to make your swim a success (link to dolphin article). The original and the best, this full-day cruise has been running for over a century! Back in the old days, a certain Mr A E Fuller was awarded the contract to deliver mail and supplies to the island farms in the Bay, and pick up the cream. Visitors started tagging along to see the sights, and thus the Fullers Cream Trip became a huge attraction! Today you can follow the historic route through the islands, deliver the mail to the locals, see stunning views and plenty of wildlife. Tours to Cape Reinga, the northernmost point of New Zealand, depart from Paihia. If you want to be able to say you’ve seen NZ from top to bottom, make sure you book a Cape Reinga day tour while you’re in the Bay of Islands. During this full-day tour you’ll drive along famous Ninety Mile Beach, go sandboarding and feast on fish and chips! Find out about Cape Reinga. With so many Bay of Islands water activities to try (like cruising, fishing, swimming, snorkelling and kayaking), don’t forget there’s fun to be had on land too. Our friends at Fullers GreatSights have put together a list of the top 10 Bay of Islands walks. Across the bay from Paihia is the historic town of Russell, which is worth a visit to see some significant sites from New Zealand’s history and enjoy the picturesque waterfront. Many visitors think Russell is on an island – it’s not! However, it is on a peninsula, accessible by a long unsealed road. The best way to visit Russell is by catching a ferry from Paihia. If you’re driving, there is a vehicle ferry from Opua. There are regular ferries from Paihia to Russell throughout the day. Best of all, you can ask to stop in Russell at the end of your Hole in the Rock cruise and receive a free ferry ticket to get back! It’s easy to get to Paihia and the Bay of Islands from Auckland or Whangarei. The journey north from Auckland to the Bay of Islands is a pleasant one, travelling through lush native forest. InterCity buses to Paihia leave throughout the day, with fares starting at just $1 plus booking fee.